A North Miami, Florida, police officer who shot an unarmed black mental health therapist was identified Friday as a SWAT team member, and a police commander accused of fabricating information about the shooting was suspended. A lawyer for the wounded therapist, Charles Kinsey, meanwhile, told the Miami Herald he does not believe a police union official who claimed the shooting was an accident. SWAT team member Jonathan Aledda was identified Friday as the cop who fired three shots during the confrontation Monday in which Kinsey was wounded in the leg. 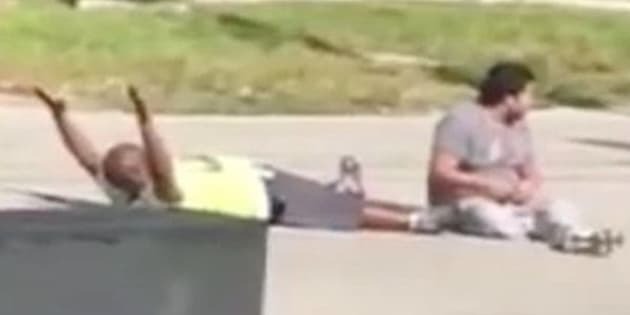 Bystander video shows Kinsey lying in the street with his hands up shortly before the shooting. Kinsey said he had been trying to calm a patient with autism who had run from a nearby group home. The patient’s toy truck apparently was mistaken for a gun by a 911 caller. The cellphone footage adds another vivid flashpoint to recent controversial police shootings of black men in Baton Rouge, Louisiana, and Falcon Heights, Minnesota. Police officers, meanwhile, have been gunned down by ambushers in Dallas and Baton Rouge. Aledda thought Kinsey was at risk from the other man in the street, according to John Rivera, head of the Miami-Dade Police Benevolent Association. The officer tried to shoot the man he thought was attacking Kinsey, but mistakenly shot Kinsey instead, Rivera said. Kinsey’s lawyer, Hilton Napoleon, on Friday cast doubt on the union leader’s explanation. He said he didn’t believe that a SWAT team member with four years’ experience would be a poor shooter. Napoleon also said the officer should have warned Kinsey to move away if the intended target was the other man. Aledda is on administrative leave while the authorities review what happened. Police officials also suspended Commander Emile Hollant without pay for what North Miami City Manager Larry Spring Jr. said were inconsistencies in his statements about the shooting. Officials wouldn’t elaborate.